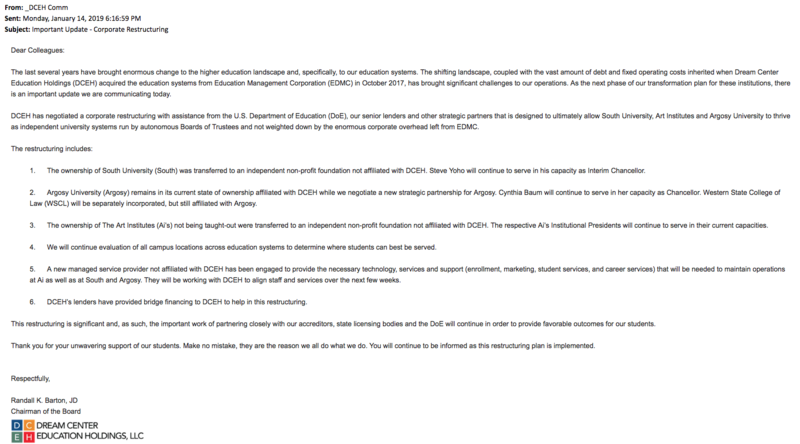 A separate email to Art Institutes staff from Claude Brown, system president of those schools, reveals that the new managed service provider is Studio Enterprise, a company that has been in discussions with DCEH for months, insiders have been telling me. “To assist in this operational transition,” Brown writes, “some of our non-academic services will be provided to us by Studio Enterprise via a standard managed services agreement. Studio Enterprise does not have any ownership interest or control over The Art Institutes or EPF.” The Los Angeles-based for-profit Studio Enterprise describes itself as a provider of services to the also-LA-based for-profit Studio School, a branch of for-profit Hussian College. A major investor in Studio is the New York-based investment firm Colbeck. Such an approach would be consistent with the recent and proposed conversions of for-profit schools including Kaplan/Purdue Global, Bridgepoint, and Grand Canyon, the Arizona-based college previously run by Brent Richardson, who is now the CEO of DCEH. That structure allows a school to advertise itself as non-profit, thus avoiding the stigma created by the predatory behavior of many for-profit schools, and avoid the federal regulations that apply to for-profit schools, while allowing a for-profit company tied to the school to keep making big profits off students and taxpayers, and to retain incentives, at least, to act in a predatory manner — high prices, deceptive recruiting, low spending on instruction. The new approach also is consistent with evidence that emerged that Richardson was from the start seeking to leverage non-profit DCEH to make money for for-profit schools and other businesses in which he and his family and close associates were invested. Finally, the new DCEH structure is consistent with new proposals by the DeVos Department of Education, scheduled to be debated in public starting tomorrow, that would allow taxpayer money to finance the wholesale shift of education services from entities separate from accredited colleges. According to Barton’s email, the DCEH restructuring was accomplished “with assistance from the U.S. Department of Education (DoE), our senior lenders and other strategic partners” –meaning the DeVos Department has apparently blessed the deal. The Department confirmed the reorganization in a statement to the Pittsburgh Post-Gazette.